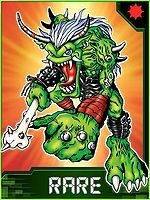 A Digimon whose form resembles that of the Oni from Eastern legends. The attacks it performs using its absurdly developed muscles exhibit tremendous destructive power. Although it has high intelligence, it has a violent temperament, and there is no limit to the destruction that it brings about with 'anger' acting as its driving force. 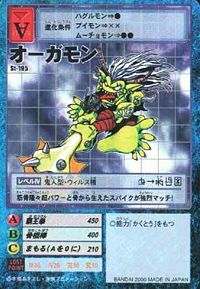 Due to its intense love for battle, it will boldly challenge even opponents that greatly surpass it in combat ability, earning it the name "Digimon Hunter". The Hone Konbou it wields in its right arm was earned from defeating Skull Greymon in battle. Its Special Move is Haouken, fired off from its two gigantic arms. — Digimon Adventure: "Messenger of Darkness, Devimon!" 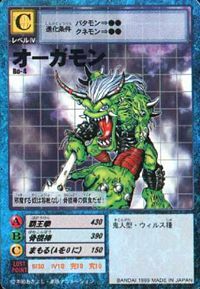 Title: 「デジモンハンター」 — "Digimon Hunter"
A small misspelling of Ogre (「オーガ」 Ōga) is a large, cruel and hideous humanoid monster, featured in mythology, folklore and fiction. 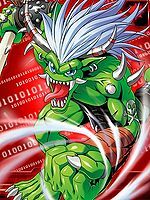 3.1.3 Digimon Savers: Ultimate Power! Activate Burst Mode!! Haouken  Supreme King Fist 覇王拳 N/A Pummel Whack Shoots a dark version of Leomon's Juuouken. 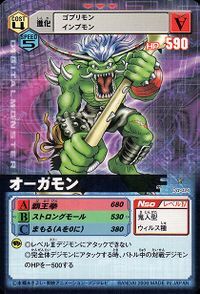 Hone Konbou  Bone Club 骨こん棒 N/A Bone Cudgel/Bone Mace Strikes the enemy with an electrically-charged Hone Konbou. フェイントパンチ Feinto Panchi Faint Punch Performs a feint by jumping in place, then uppercuts the opponent. 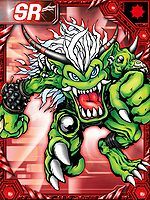 Orgemon was an aggressive Digimon and rival of Leomon. He makes his debut in "Messenger of Darkness, Devimon!". He is first a minion of Devimon, but later joins the Chosen Children against the Dark Masters. 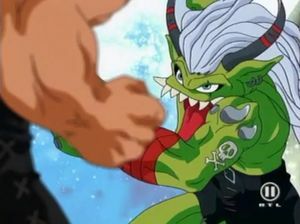 25 years later, another Orgemon is seen with a hurt arm and is being tended to by Kido Jou, who is now the Digital World's first doctor as seen in the epilogue of the series. Ogremon is seen among a group of Goburimon which pursues Rhythm. An Orgemon and a Fugamon worked hard to prepare the best ramen over the world in DigiQuartz. In order to get their wish, they worked alongside a human cook, father of a boy named Masaru. When Orgemon and Fugamon got out of control, Tagiru had to hunt them, so they became part of his Collection. 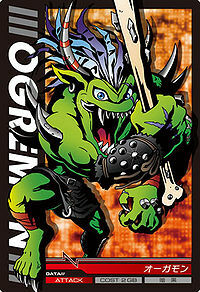 Tagiru has used Orgemon in a DigiXros once. In "Before the World Ends", Orgemon finds the Tags in a cave and refuses to deliver them to Tailmon and Wizarmon. After the appearance of Leomon, both fight and end up sinking in the ocean. 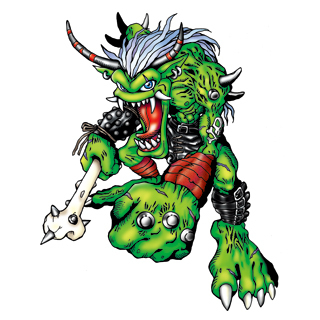 Orgemon appears as an obtainable Adult-level Virus type Digimon in Digimon World. 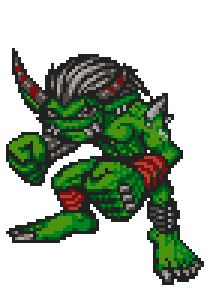 Orgemon appears as a minor antagonist in the game as well. To see Orgemon for the first time, the Player needs to talk to Yuramon twice, after crossing the invisible bridge in the Great Canyon and Yuramon will warn the Player about a group of bandits lurking around and assaulting passersbies in the Great Canyon. When reaching there, Orgemon and a gang of Agumon and Gabumon will end up attacking the Player, engaging a battle. After defeating the gang, Orgemon will escape into its fortress. When arriving there, the fortress will be full of Agumon and Gabumon guarding the area and will attack the Player if spotted, though they provide an easy battle. After reaching Orgemon in its room, a battle will be engaged and after its defeated, Orgemon will abandon its fortress and escape again. If the player comes back to this area, Nanimon will be found. In Freezeland an angry Whamon will request the Player's help because Orgemon stole and took away its cave, so the Player has to ferry on Whamon to its cave, where Orgemon, with several Gabumon and a Waru Seadramon await for the Player, into another battle. Once its defeated for the third time, Orgemon will escape again, and Whamon will join the Village of Beginnings. The last encounter takes place inside the Drill Tunnel, with a third attempt of Orgemon taking territory. The Player will engage into another battle and, after defeated Orgemon will lament itself how he's never been able to defeat the Player and ends up joining the Village of Beginnings and finally ending all sources of his crimes. Orgemon doesn't really do much in the Village other than stacking up Prosperity Points, but it says its patrolling the city and keeping it safe. Bonus conditions: Battle more than 15 times and have at least 28 different techniques mastered. 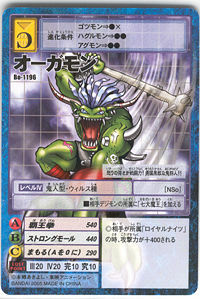 Orgemon's Digivolution item is the Spike Club which lets any Child Digimon evolve into Orgemon. 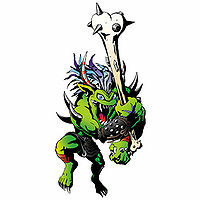 Upon contact with the enemy, Orgemon will use its bone club and smash it on the enemy. 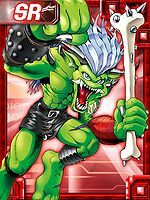 Orgemon is an obtainable Digimon. 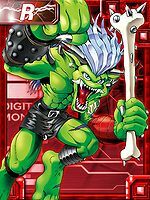 Evolves from Goburimon (0+ DP) and can evolve to Etemon (0+ DP). 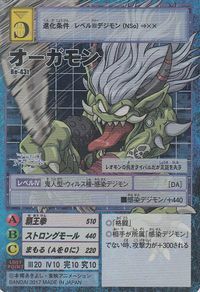 Orgemon evolves from Goburimon and can further evolve to Etemon. The Orgemon present in this game is commonly mistaken with Fugamon due to his unusual brown colouration and tiger stripe outfit. Can be evolved from Goburimon if above level 7 and Attack above 70, or can be found at Data Forest. It can evolve to Etemon if above level 33 and Beast EXP above 3500, or Archnemon if above level 16. He also appears as a boss Digimon at Data Forest. Can be evolved from Goburimon if above level 26, attack 120, and Beast EXP 750, or can be found at Chip Forest. Can evolve to Were Garurumon Black if above level 41, speed 190, and Dark EXP 6500. Evolves from Goburimon. 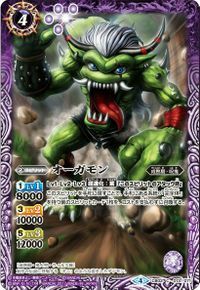 Can evolve to Waru Monzaemon, Etemon or Pandamon. 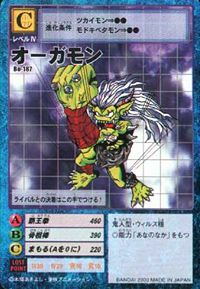 Orgemon appears in the Scheme of the Demon Lords chapter (策謀の魔王篇 Sakubō no Maō-hen) as the minion of Barbamon. It is also an obtainable Digimon which is evolved from Goburimon, Betamon, Gabumon or Tyumon, and can evolve to Digitamamon, Etemon or Waru Monzaemon. It can also be obtained as a collectible card. 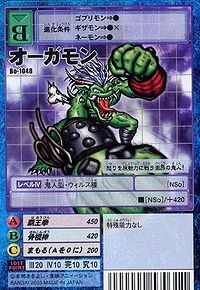 Its card is part of the The Ogre's Way of Life (鬼の生き様 Oni no Ikizama) set. Evolves from Patamon or Kunemon. Can evolve to Andromon. 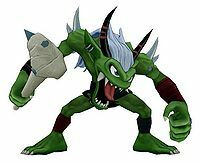 Orgemon is an enemy Digimon in Area 06 and 07. Evolves from Goburimon, Falcomon or Mushmon. Can evolve to Whamon or Gerbemon. 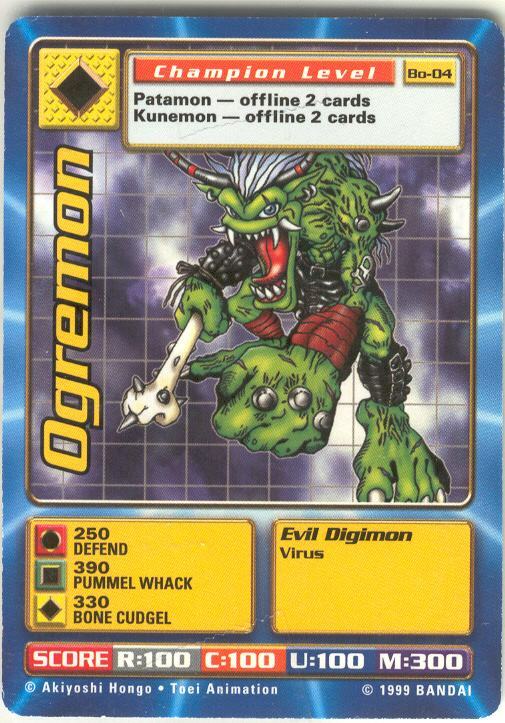 Orgemon is an enemy Digimon. Its powerful muscles and the spikes that grow from its bones make it a tough match! It shows no mercy to those who get in its way! They become the victims of its bone club! It will settle its rivalry by its own hand! This raging ogre fights with anger as its driving force! The strength of its anger is its fighting power! A daring and resolute hunting ogre!! Leomon's good rival who has lost its mind. Possessing high intelligence and a well-toned body, this Digimon Hunter takes on powerful Digimon while fueled by rage. True to its alias, it wields a bone club as proof of having defeated a Skull Greymon. 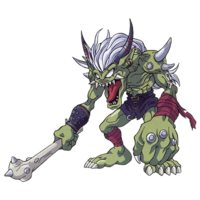 A Digimon whose form resembles that of the Oni from Eastern legends. Digimon Adventure Digimon Adventure Digimon Adventure tri. ↑ Digimon Adventure V-Tamer 01: "Another Tamer"
↑ Digimon Xros Wars: "All Will Be Revealed Now! The Secret of the Digimon Hunt!" This page was last modified on 28 December 2018, at 18:28.